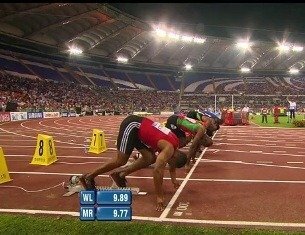 I wrote about the possibility of the IAAF changing their Track and Field Rules for 2012 because of the Usain Bolt DQ in Daegu. Here is the current Track and Field Rules for 2012, in English. Click here for the 284 pages, 3MB PDF file. Everyone should read this, as you have to know your rights, and especially know when to protest! An athlete, after assuming a full and final set position, shall not commence his start until after receiving the report of the gun. If, in the judgement of the Starter or Recallers, he does so any earlier, it shall be deemed a false start. If you aren’t ready, for example, for some reason your blocks don’t feel right, or something is bothering you like the crown noise, you can raise your arm and DO NOT ASSUME THE “ON YOUR MARKS” POSITION. According to the rules, you will NOT be charged with a false start. The starter’s job is to everyone to have a fair start. Once the Starter is satisfied that all athletes are steady in the“Set” position, the gun shall be fired. the Starter shall abort the start. The Referee may warn the athlete for improper conduct (disqualify in case of a second infringement of the Rule during the same competition), according to Rules 125.5 and 145.2. In this case, or when an extraneous reason was considered to be the cause for aborting the start, or the Referee does not agree with the Starter’s decision, a green card shall be shown to all the athletes to indicate that a false start was not committed by any athlete. This rule is not commonly known, but it does happen. You can orally protest to the starter or referee and still run the race under protest (which may get nullified if your protest gets rejected). It’s like a “provisional shot” in Golf. But with today’s starting blocks with pressure sensitive pads, once it detects a movement less than 0.100 seconds, you’re gone. i want if the second lane RDR is 39.62 mt the corresponding CDR is ? Hie! My 4x400m was disqualified today by the line judge and the reason advance was that my athlete when passing another athlete he passed him on the inside thereby getting an affair advantage by stepping outside the track. I would like to know the following. 1. Is there any distance allowed for an athlete to step outside the line. 2. Is there any markers placed on the scene. Most relay rules allow 20m for a passing zone, which are clearly marked. However, Canadian Colleges use the open zone, so there is max distance in passing the zone.